We're on to YELLOW, folks! Today we went to the ocean with grandma and grandpa...it was an absolutely beautious day! We don't own a yellow bucket, but someone does, or rather, did. 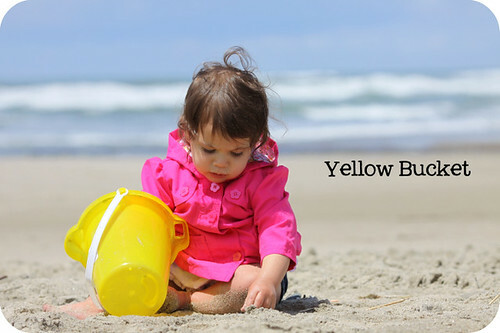 We found some abandoned buckets on the beach, and Lucky Day they were yellow! So, we let Josefine play in the sand with the abandoned yellow buckets. Ah, family...the beach...and sunshine...and sand...and a yellow bucket. Perfect.